Natural wonders abound, including the nearly miraculous complexity of a healthy soil ecosystem. In a totally natural system, the living plants growing at the site continually deposit organic material onto the surface of the soil as they shed their leaves, flowers, fruits, and even branches. Eventually, they die and fall to the ground, returning all the mineral components they have taken up from the soil. But these minerals can only be liberated if bacteria, fungi, and other decomposers are present in the soil. Of course, natural systems such as this are not to be found in urban landscapes. They can be reinstated, at least in part, by careful nurturing of the components that support them. Encouraging the microscopic flora is key. First, it will be important to discontinue the use of chemical fertilizers and pesticides that degrade this intricate soil food web. This will allow the remnant populations of decomposers to regenerate. Some of these beneficial organisms are available commercially, and applying them can jump-start the process. Mycorrhizal fungi are the most readily available; follow application directions for best results. These fungi are killed by the heating of compost and may not be present at all in degraded soils. They need to find active roots within 24 to 48 hours of germination of their spores, so they should be added just before planting or to established plants with intact roots. The most important way to help to enhance this soil food web is to add organic matter; feed the soil, and the soil will feed the plant. Soil with 2-percent organic matter has a reserve of 2,000 pounds of nitrogen per acre. Nitrifying organisms transform this stored material to nitrate available for use by plants. The easiest method to add organic material is to cover the soil with organic mulch. Layering compost, wood chips, or any organic material on the soil surface will discourage weeds, reduce water loss, and increase the organic-matter component of the soil, providing microorganisms with a source of food. Mulch layers need to be replenished as they break down, and a rule of thumb is to pile on the organics to a depth of three or four inches. For a bigger boost in the numbers of beneficial organisms, compost can be added as an amendment when planting. 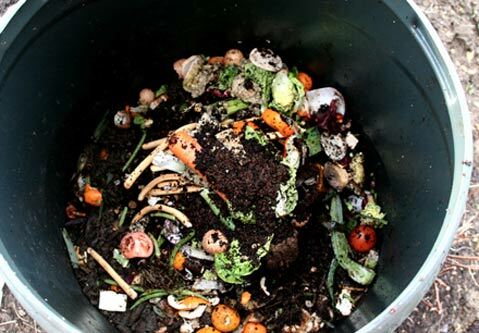 Proper composting of organic waste reduces landfill requirements and provides a source of organic material that is weed-free and contains an enormous number of beneficial soil organisms. Composting is not hard; it consists of assembling the right materials and occasionally monitoring the pile. Following are the basic things to consider in making good compost. Nitrogen is key. Some kind of manure is the easiest to obtain, but even a touch of fertilizer can be sprinkled on if chickens, goats, or other livestock aren’t available. The majority of the material will be carbon-rich. This is the green-waste part of the equation and consists of grass clippings, leaves, weeds, and such. The easier the nitrogen is for the bacteria to use, the faster the bacteria will grow, the more rapidly the temperature will increase, and the hotter the pile will get. Hot composting kills weed seeds and pathogens that may be lurking on the green waste. Particle size of the starting materials is also important. The smaller the size of the particles, the easier it is for bacteria to use the carbon, but the addition of chunky material will let air diffuse into the pile more rapidly and cool it. So composting can go “low and slow” with larger material, or with more attention and repeated turning of finer particles, finished compost can be created in a few weeks. Be aware that if the temperature increases too quickly and becomes too high, the oxygen will be used up, resulting in anaerobic conditions. Decomposition will still happen, but it will be a stinky process. One last component to incorporate is moisture. These tiny organisms need water to grow, but not too much. Soggy compost piles will lead to anaerobic conditions. Anaerobic bacteria produce toxic alcohols, phenols, and terpenes, as well as objectionable odors. A healthy compost pile should smell earthy and good, not like rotten eggs or soggy diapers, and the finished compost should be dark in color, fine in texture, and smell like the forest floor.